It's Queen's Day in the Netherlands today, April 30th, and the annual official celebration of the Queen's birthday means Dutch citizens will liven up the streets and canals with bright orange banners, balloons, costumes, and flags once again. 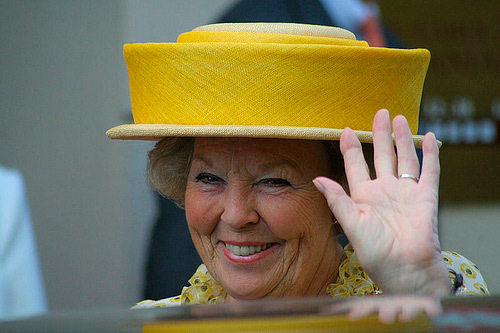 Queen Beatrix's real birthday is January 31st, but no matter - April 30 was her mother's birthday (Queen Juliana) and was chosen as the day to celebrate in 1948, and so it remains. If you love cultural celebrations, traditions, national events, or local parades around the world, then visit Holland for Queen's Day. The orangemania (or oranjegekte in Dutch) that takes over the country is quite a sight to see. Orange is the official color of the Queen and the royal family, descendants of the dynastic order of the House of Orange-Nassau. These photos were all taken in Amsterdam during orangemania after Holland's national soccer team came in 2nd place in the 2010 World Cup. Hmmm...this is the second post of yours in a week where I've felt the need to point out that I look terrible in orange. Are you trying to give me a complex? Hee hee - how funny! But c'mon, I bet that curly orange wig would suit you well. I love all the orange - but I do think it looks far better on the Dutch than it would on me. :) In Canada we have an official celebration of the Queen's birthday that falls on the Monday before May 25th and gives us a long weekend holiday. Oh, thank you! Very good to know!